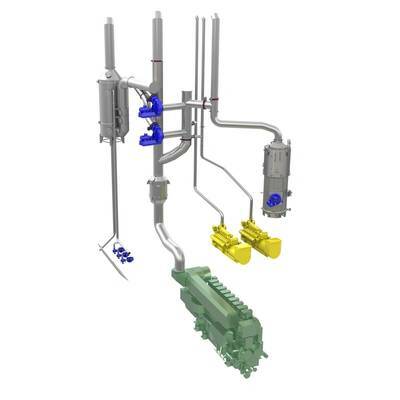 The SAACKE Exhaust Gas Cleaning System (EGCS) Configurator allows the optimum design of a scrubber system to be determined in advance. The tool uses the input ship and operating data to calculate details concerning the system design, such as the dimensions, number of components or the size of the pump system. All other relevant indicators can also be freely configured, depending on the application profile and deliver important findings for subsequent system operation in the early planning phase, such as the maximum length of zero-discharge phases to comply with the regulations in the zero-discharge zones or the return on investment (ROI). The configurator also uses a new calculation model to determine the pH value at the washing water outlet. This was developed by SAACKE GmbH and has already been successfully used in former projects. The EGCS Configurator increases transparency and planning reliability from the first customer meeting – the installation space and necessary installation measures in the ship can be directly estimated based on a visual representation. Of particular interest for ship operators is the ROI for the entire system based on current fuel prices as it assists with the investment decision. The EGCS Configurator is a fixed part of the SAACKE scrubber system design. A new calculation model for the pH value of the EGC system is also integrated into the configurator. The guidelines provided by the International Maritime Organization (IMO) specify that the pH value of the washing water must not fall below the value of 6.5 at a distance of four meters from the outlet of the exhaust gas cleaning system. Two standard models currently exist to achieve this pH value, resulting in limit values in a range of 6.5 to 6.1 directly at the washing water outlet. The calculation model developed by SAACKE now makes it possible to achieve a pH value of 5 directly at the washing water outlet. The lower the permitted pH value at the washing water outlet, the lower the quantities of dilution water or caustic soda (NaOH) that need to be added to achieve this value. In these cases, pump capacities to transport the dilution water can be smaller and the amount of added caustic soda can be reduced. “For ship operators, this means significant savings, since ongoing operating costs fall and the efficiency of the entire system increases. Investment costs can also be saved during installation, as a smaller system is cheaper and requires less installation space”, says Nils Homburg, Manager Exhaust Gas Cleaning Department at SAACKE. He calculates this based on a specific example: “A pH value of 5 compared to 6.5 reduces the dilution water quantity to 550 m?/h for a main engine output of ten megawatts – a third of the original quantity. When using caustic soda, consumption is halved to 150 l/h“, says Homburg. The combined use of washing water and NaOH dosing for pH value regulation is possible. In this case the reduction is calculated based on a combination of the two cases mentioned above. The example calculation applies when using heavy fuel oil (HFO) with a 3.5% sulfur content. To ensure the compliant operation of the scrubber system, a sensor continuously measures the pH value at the washing water outlet and forwards this to the EGCS monitor, which records all operating data for the EGC system. The EGCS report can be created from the monitor at any time at the push of a button in order to provide proof of the correct pH value and compliance with the IMO guidelines for the authorities. This facilitates the cooperation between the ship’s crew and local port authorities. The pH value calculation is requested with every ship authorization as a method recognized by the classification societies. The first authorization was received by the tanker MT Levana, owned by the Carl Büttner GmbH & Co. KG ship management company, which has been equipped with a SAACKE scrubber since November 2013.